This 24-inch TV is perfect for those who are looking for a smaller sized TV that can be used as a second monitor for their computer or just simply used as a TV. It comes with a vast variety of features which you would not normally expect on a TV of this size, and is really affordable as well. Samsung is a well known and respected manufacturer, so your TV is surely built to last as well as stand the pace of time. The picture on this TV is detailed and sharp with excellent array of colors and deep blacks and whites. The most amazing feature of this TV is its online content-it makes it stand out from other televisions in the price range and size. Samsung UN24H4500 benefits from a Smart Hub similar to bigger HDTVs, and this allows its users to play games as well as watch movies, TV shows, and sports on a smaller screen. On top of all this, you are also able to go much further with S Recommendation and full web access. You will get a really great viewing experience with this TV. Despite the fact that it is only a 24-inch TV, its color production is really impressive. This model from Samsung also achieves deep black levels so that darker images have a respectable amount of detail. One of the key features of this TV is Wide Color Enhancer Plus that improves colors so you’ll have a perfect display for movies. Also, you’ll be able to enjoy more vivid and enriched colors when watching your favorite TV shows, even if the content is older and non-HD. An amazing level of motion clarity (Clear Motion Rate 120) allows you to view every detail of sports and action packed movies. 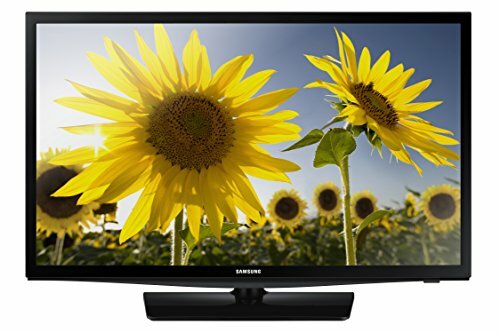 The Samsung CMR utilizes the frame refresh rate, backlight technology, and image processor speed to measure fast action. For an entry-level TV like this one, there is a rather impressive amount of connection ports located on the back of the panel. Samsung UN24H4500 boasts 2 HDMI ports, 2 USB ports, a digital audio output, shared component/composite inputs, RS-232, an Ethernet port, a coaxial connector, and a headphone jack. This TV is equipped with Smart Hub, Samsung’s smart platform. All the usual and well known apps like Facebook, Netflix, HBO Go, Hulu, and more are here, either available for download or pre-installed. With this Smart TV, you can connect to your favorite contents and manage it at the same time utilizing the Smart Hub Panel. The smart feature on this TV works exceptionally well, and allows you to easily navigate through movies, live TV, social networks, streaming content, apps, games, and many more.